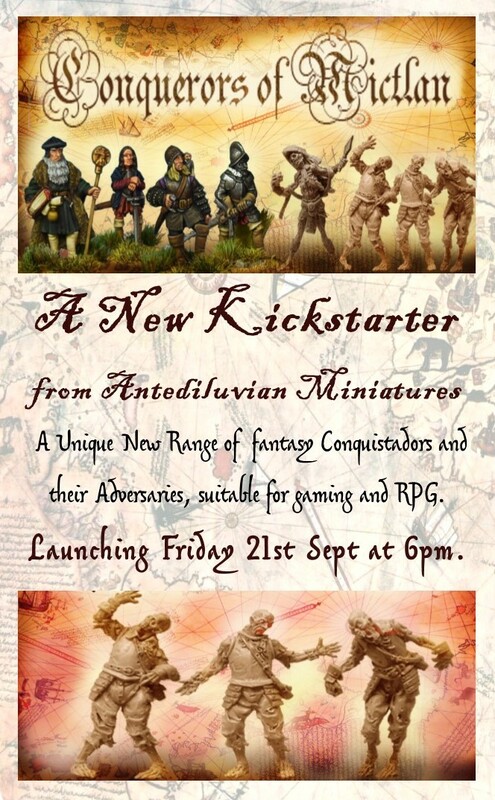 We are launching a new campaign to produce a new range of 28mm Fantasy Conquistador miniatures and their adversaries, suitable for Wargaming and RPGs. These brave or foolhardy individuals are on an ambitious quest to discover the mythical land of Mictlan with it’s untold treasures and fabled key to the secrets of life and Death. The expedition may get some important lessons on the arcane mysteries sooner than they think! The denizens of this strange new world may present some horrifying challenges and A terrifying Lich is master of the unfortunate souls who perished on previous doomed expeditions. We will have a range of pledges to suit all budgets, with add ons and un-locks. The campaign will run for 30 days. the kickstarter is here !